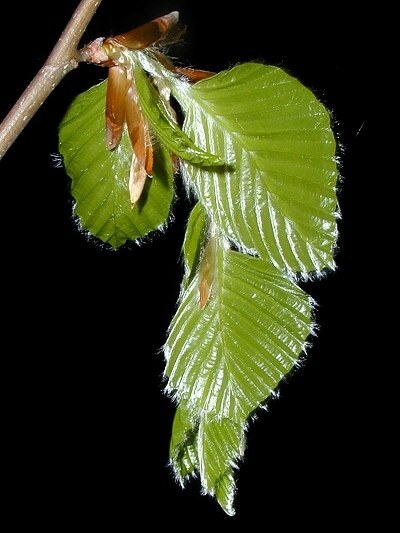 Description: The Beech is part of Fagaceae family. This tree can be found in Europe, Asia, and North America. Without agriculture and forestry the Beech would predominate the European woods. The trunk is grey and smooth growing up to 100 feet in height. The leaves are entire or sparsely toothed, from 2-3 inches long and 1,5-2 inches broad. The male and female flowers are found on the same tree. They appear together with the new leaves and are in full flower from April till May. The fruit is a small, sharply 3-angled nut 0.4 Â– 0.7 inches long. The nuts are edible and sometimes bitter because of their tannin content. Enormous tolerance. One ignores other peopleÂ´s weaknesses too much.